Prang's exclusive blend of soybean oil and brighter, more intense pigments makes these crayons brighter, smoother, and less flaky than ordinary wax crayons. Blend them together for an even more extensive color palette! 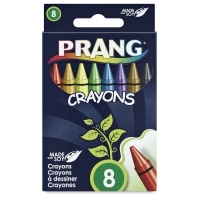 Try Prang Soy Crayons and see why they're preferred by students and instructors. Crayons each measure 3-1/2" long × 5/16" diameter (88 mm × 8 mm). 8-Color Set — Set contains eight crayons, including one each of Red, Orange, Yellow, Green, Blue, Violet, Brown, and Black. 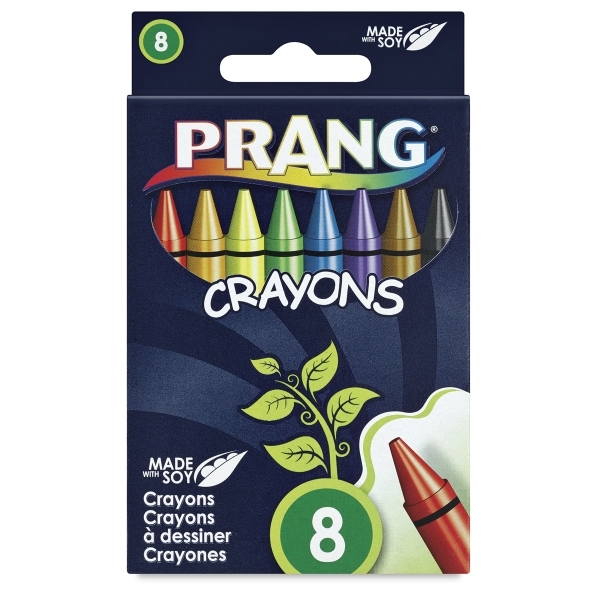 Regular Size (800 Count) — This classroom set includes 100 each of Red, Blue, Green, Yellow, Black, Purple, Orange, and Brown. 16-Color Set — This tuck box contains all the colors from the 8-Color Set, plus White, Pink, Blue-Green, Blue-Violet, Red-Orange, Yellow-Orange, Yellow-Green, and Red-Violet. 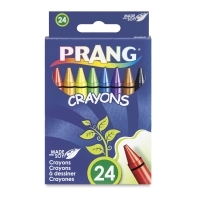 24-Color Set — This tuck box includes all of the colors found in the 16-Color Set, plus Gray, Magenta, Turquoise Blue, Dark Yellow-Orange, Light Orange, Dark Blue, Light Blue, and Dark Red.